If you haven’t seen what we are doing with Social Media Club here in Paris at Le Web, now is the time to pay attention because we are just heating things up. As we prepare to embark on our 3rd day of Parisian adventures before Le Web starts tomorrow, everyone is finally arriving today. 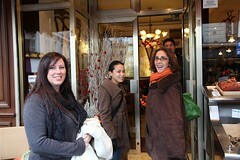 After touring Montmartre and Sacre du Cour yesterday, we went to La Cantine for a Social Media Club Paris happy hour. Today we did a live stream over on Justin.tv talking politics, culture and technology with Fabrice Epelboin from Read/Write Web France. Now we are off on a tour of Paris with Juliette Drumas of Briller en Ville a sort of Daily Candy for Paris (but we think cooler ;). These are a few of the photos I took that tells the day’s story quite well. This entry was posted on Tuesday, December 8th, 2009, 6:18 am and is filed under Social Media Club, SocialMedia. You can follow any responses to this entry through RSS 2.0. Both comments and pings are currently closed.